Die Collection Rolf Heyne bringt nun im Februar ein Parfumlexikon auf den Markt. „Das große Buch vom Parfum“ geht auf viele Überlegungen und Gespräche mit Frank J. Schnitzler zurück, der schon lange überlegte, alles Wissenswerte rund um das Thema in einem Kompendium zusammen zu stellen. Wir haben viele Tage damit verbracht, Informationen über Düfte zu recherchieren und in kurzen Skizzen darzustellen. Am Valentinstag 2011, also dem 14. Februar, erscheint das Buch im Handel. In regelmäßigen Abständen werde ich über den Fortgang berichten. Meiner Meinung nach ist dieses Kompendium eine wunderbare Momentaufnahme der Parfum- und Parfümerieszene und ideale Adresse an das Wirken und die Arbeit von Frank J. Schnitzler. Darüber hinaus gibt es aber mittlerweile solch eine Vielzahl an blogs und Foren, die sich mit den Themen Duft und Parfum beschäftigen, dass man von einer parallelen und partizipativen Online-Welt sprechen kann: parallel, weil dieses Medium das Wissen und Handeln von Produzenten und Konsumenten interaktiv macht, partizipativ, weil es die Leser zum „Meinung abgeben“ in der Web 2.0-Welt anregt. Unterstützt also das Instrument „Internet“ an gewissen Schnittstellen die partizipative Kreation und unterminiert die ehemals ehernen Säulen einer „Marke“? In February 2011, Collection Rolf Heyne will have our perfume encyclopedia which I compilated with Frank J. Schnitzler available on the German market. 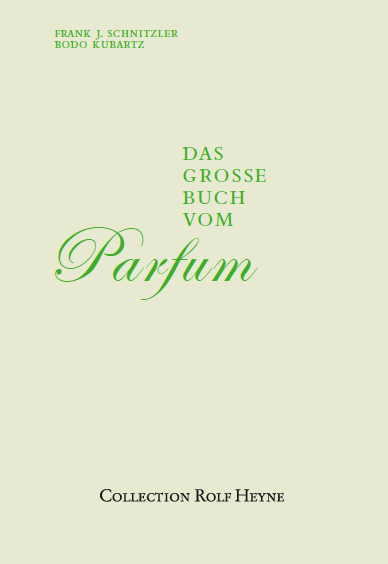 „Das große Buch vom Parfum“ (= „The large book on perfume“) is based on a lot of thoughts and discussions with Frank J. Schnitzler who already considered creating a compendium on perfume. We have spent a lot of time collecting and synthesizing information into brief descriptions of perfumes. Collection Rolf Heyne elaborates on that online. The book contains brief descriptions of more than 1000 perfumes and integrates a lot of additional background. The compendium addresses the love and passion for perfume. It will be launched by the published on Valentine’s Day 2011, thus, February 14. I will keep you posted about all upcoming events in this respect. In my opinion, the compendium allows a unique momentary view on the perfume and perfumery world and it is an ideal dedication to the work and participation of Frank J. Schnitzler in the international perfumery scene. However, beyond that, a multitude of blogs and forums on scents and perfumes exist that create a parallel and participative online world: parallel, since the web allows to co-determine knowledge and action of producers and consumers in an interactive way, participative, because readers are able to share their views and influence further action. Thus, does the instrument „internet“ support at particular points a participative creation and does it undermine the previous iron pillar of „brand“? Pingback: DAS Buch im neuen Jahr! Alles über Parfum | Schnitzler Consulting. Düsseldorf.